Production: Carte Blanche. Choreography: Nuria Guiu Sagarra. Photo by Yaniv Cohen. 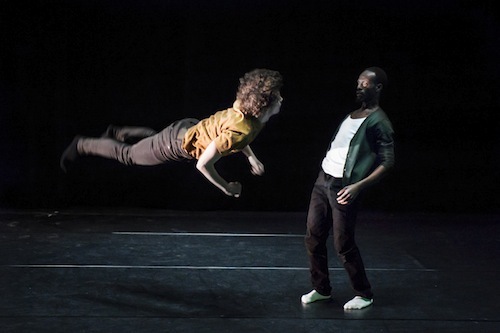 Written and performed live music and sound-design to contemporary dance performance La Muda, performed at the Opera, Oslo and Studio Bergen, 2013. Núria Guiu Sagarra moves in an Alice in Wonderland-inspired hyper-reality in which “the copy of reality is worth more than the actual reality”. The performance integrated social media extensively. The music and sound-design used sounds of social and digital media, turned into dynamic, playable instruments or atmospheric soundscapes or percussive patterns. Here is a Youtube trailer showcasing some of the music and performance. La Muda is the spanish word for a woman; the mute, but also the one who changes skin.